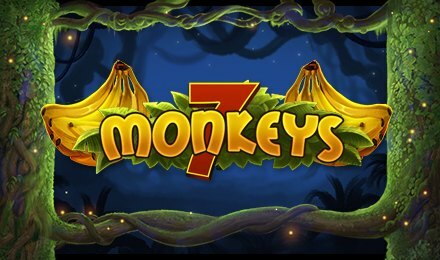 7 Monkeys Slots | Moon Games Casino | Play Now! Pragmatic Play outdoes itself once more with the highly innovative 7 Monkeys slots. Loaded with 5 reels and 7 paylines, the game is themed on monkeys that live in the blooming jungle. Embark on a unique adventure and head deep into the jungle by starting this game at Moon Games Casino! On the reels of 7 Monkeys slots, you will discover; Yellow, Green, Orange, Blue and Pink Monkeys, Bananas and a Rainbow Monkey. On launching 7 Monkeys slots, the monkeys in the game sit and mock you! While having a laugh at this, you will see that there are different controls on the screen, that make your gameplay way easier. The Autoplay option, allows you to select a number of game sequences that range from 10 to 1,000. Other options allow you to select your bet amounts and more. Bet Levels: Bet levels range from 1 to 10. Amount of Paylines Selection: All 7 paylines are fixed and cannot be adjusted. The rainbow monkey is the wild of the game and replaces any other symbols except the scatter symbol. The scatter symbol is the bananas, which triggers the Free Spins Feature of the game. You can win an unlimited amount of free spins on 7 Monkey slots. When three, four or five Scatter symbols land anywhere on the reels, a certain number of multipliers are awarded.